Akatsuchi is a Jonin from Village Hidden by Rocks. He is often described as a “shield” for the Third Tsuchikage. Although Deidara was a criminal and a member of Akatsuki, Akatsuchi has has a great admiration for Deidara. Let’s take a look at the abilities of Akatsuchi. Taijutsu Earth Style – Golem Jutsu: Resummons a Stone Golem, or cause damage and Knockdown to the opponent’s entire team if stone giant already exist in the field. The skill is immune to Interruption. 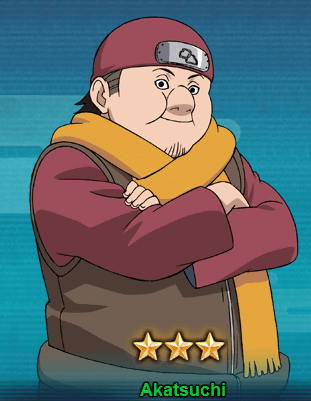 Ninjutsu Earth Style – Petrifying Jutsu: Generates a Shield of up to 2 units with the least Life points from your Lineup based on 20% of each unit’s Resistance base attribute. Ninjutsu, Taijutsu Earth Style – Sphere of Graves: Chases and Attacks a Repulsed unit, causes Knockdown. Ninjutsu Summoning Jutsu – Stone Golem: At the beginning of a battle, summon 1 stone Giant of 100% Life of the original unit. Ninjutsu Defender of Hidden Stone: At the beginning of a battle, generates a Sheild up to 9 Earth or Fire attributes ninjas from your field based on 30% of this unit’s Resistance base attribute. You can get Akatsuchi from the Kage Treasure. It will take almost 10 seal scrolls draw to get Akatsuchi.